Four books in this funny series, starting with "The Werewolf at Home Plate." 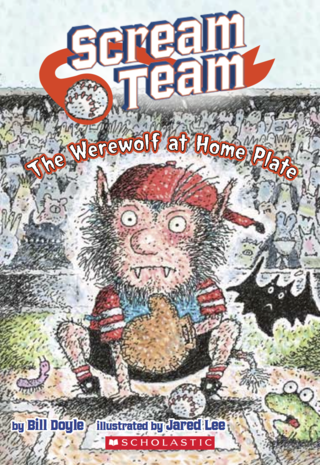 A squad of misfit monsters who team up to play sports...four books so far in this Scholastic series: The Werewolf at Home Plate, The Vampire at Half Court, The Big Foot in the End Zone, and The Zombie at the Finish Line. All drawings by Jared Lee, the illustrator of the Black Lagoon series! Interactive Adventures, Mysteries, and Action-Packed True Tales for Readers 6-15...find the right one for you! Cal Talaska can’t wait for his family to win the Great Grab Contest! The prize? Twenty minutes to grab anything in the world-famous Wish Shoppe! He knows his family will leave the competition in the dust, but first he has to convince them to compete! An interactive adventure like no other! On this epic climb up Mount Everest, readers are part of the youngest team ever to climb the world's tallest peak. My second "Behind Enemy Lines" book is about real-life heroes risking everything for their country in modern-day conflicts. Cousins Henry and Keats takes on magical odd jobs for the kooky Mr. Cigam—and find themselves battling monsters in these funny adventures. Wacky, misfit monsters start their own team in the Junior Monster League. The Scream Team books are available everywhere online and in stores. I led an extremely fun week-long digital storytelling lab for kids at the Met in NYC. Read about it here. A Q&A about developing my apps "Nash Smasher!" and "My Dad Drives a Roller Coaster Car"
Check out how I got started as a writer...and more at this fun site for writers and grown-ups who love middle grade (kind of spooky) fiction! My new app book company I started with designer Rachel Ericson. Our first apps: Nash Smasher! and My Dad Drives a Roller Coaster Car.